Are there any diseases which greater risk of getting a trigger finger or a trigger thumb? Can a child affected by a trigger finger or trigger thumb? After surgery „below“ (proximal) the scar has formed a nodular thickening, which was not before the operation. How is that? Can more than one finger be affected by triggering at the same time? What complication may occur if a trigger finger is treated by splinting in extension? Is it possible that a snapping finger (trigger finger) after an operation occurs at the same finger? A snapping is possible but rare. A frequent finding at surgery in this case is a nodular thickening of the flexor tendon. Known as Notta’s node. This condition is an early stage of a Dupuytren’s contracture. 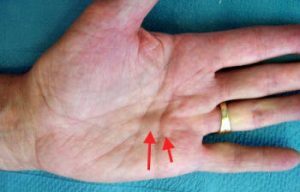 The hand of patients with Dupuytren’s contracture is affected by a thickening and shortening of the connective tissue in the palm. In some case an experienced hand surgeon palpated before operation a thickening of the connective tissue just under the skin. In other cases the thickening of the cords in the hands develops after surgery. (But even after an injury). The reason why, is not well understood. Some of these patients had a hereditary disposition of Dupuytren’s disease. Yes of course! Repetitive or forceful use of the hand often narrows more than one tendon sheaths in one hand. Remember: powerful gripping a golf club, tennis rackets….. This treatment can cause stiffness of the finger (or thumb). 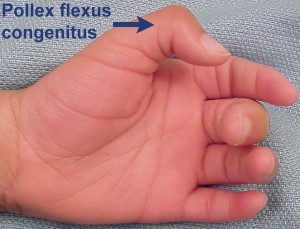 In rare cases the affected finger cannot flexed. This is a possible complication after surgery. If triggering is not resolved after surgery, one cause is an incomplete division of the A1-pulley. In very rare cases this condition is due to a second narrowing in the tendon sheath. Recurrent triggering is rare after successful surgery of a trigger finger or trigger thumb. In a case of recurrent triggering, it is advisable to look for coexisting diseases, especially rheumatic arthritis.